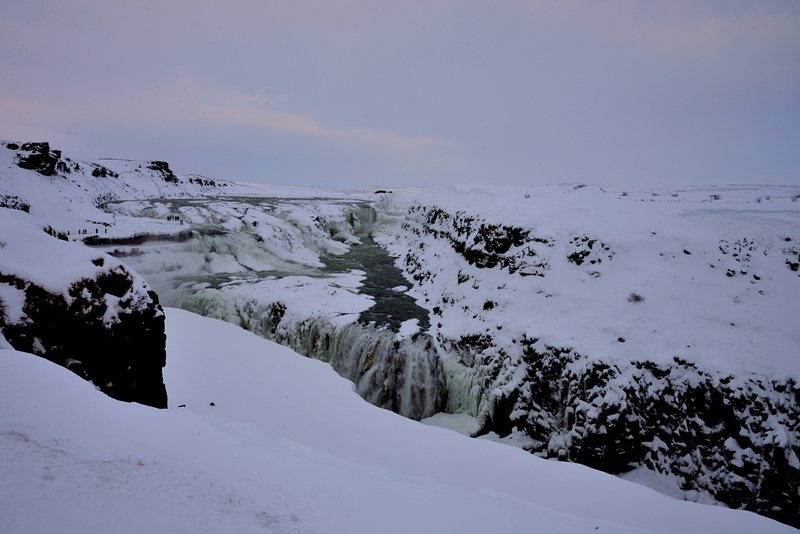 We finally give in to the “tourist route” and join (a sparing few) coach buses to the Golden Circle, which touches the famous sights of Thingvellir National Park, Geysir, and Gullfoss. But the drive, I am convinced, is not to a tourist trap but into the depths of Siberia. There was nothing but vast whiteness ahead; snow-covered plains lie in front of snow-covered mountains, as our snow-covered rental car skid atop the lonesome icy road. We make a stop at a lookout point by Thingvallavatn Lake, the largest natural lake in Iceland. As soon as we pulled in our front wheels became mired in a foot of snow, but a small group of warm-hearted fellow adventurers helped us push our car out of the quagmire. We admire the blood-stained sunrise views before passing on the love, helping a 4×4 Jeep push out of the same trap we fell into just minutes ago. Another precarious hour of driving later we reach the nicely furnished Geysir visitor’s center, rising out of the snow like an oasis in a desert. 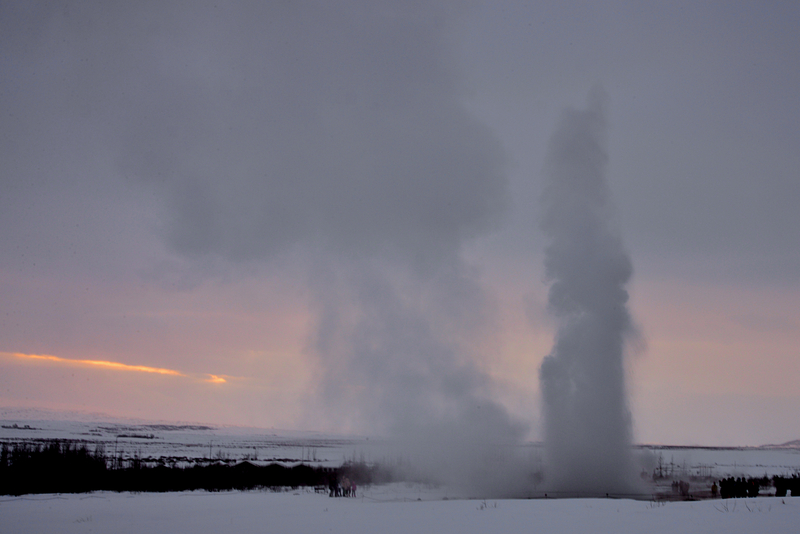 The original Geysir, the root of the English word “geyser”, is no longer active; but its smaller cousin, Strokkur, continues to put on a show for visitors. The eruptions are irregular but averages once every 5-7 minutes; an army of photographers stand waiting patiently if also nervously, afraid they will miss the perfect fraction of a second to click and capture the peak moment of release. A brief 10 minute drive away, Gullfoss (Golden Falls) appears as if out of nowhere; there is no mountain to drive up to see this force of nature, as the water dumps into a rift valley below. For the adventurous who ignored the chained-off warnings, a brief downward hike on a narrow trail takes you closer to the origin waters that feed the beast. 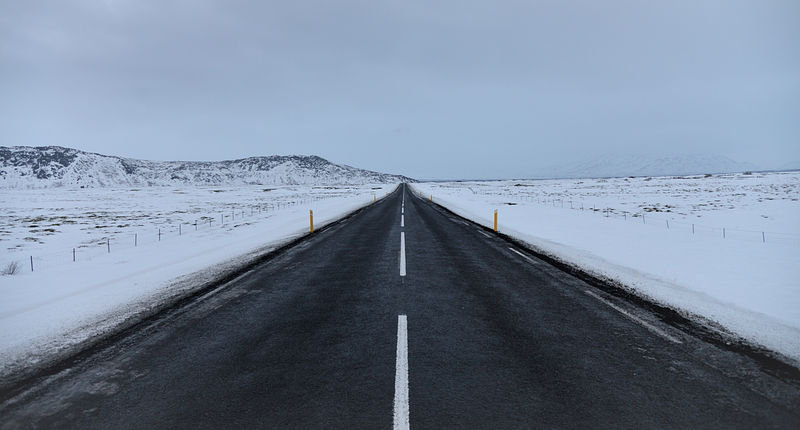 The day grows weary and we reverse our tracks, returning to Reykjavik for a cozy Thai meal. 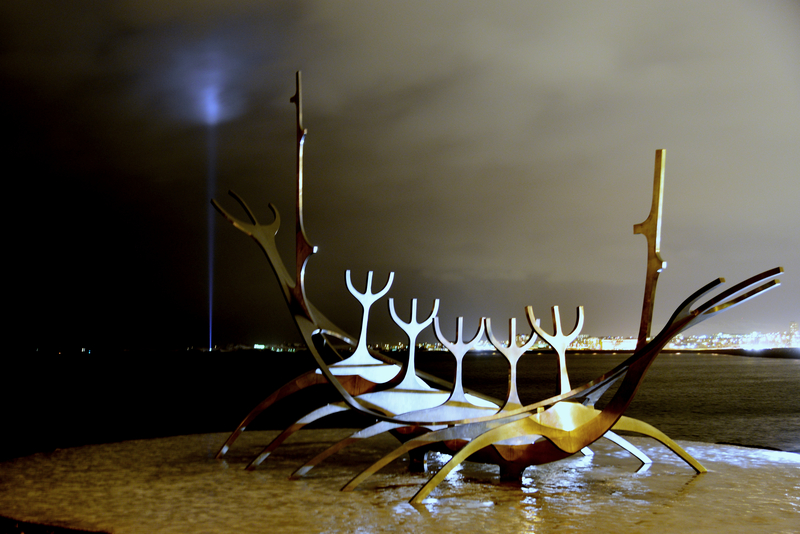 Despite the smoky clouded skies that gave Reykjavik its name, we found another type of light show to wrap up the day’s adventures. Great photos. And a great blog! I look forward to reading more of your adventures.